Barney’s point is well taken considering the breadth of campuses the company serves, from urban community colleges to teaching hospitals, technical schools and Ivy League universities. Deciding what exactly goes onto the shelves of the ninety-seven Barnes & Noble College stores that provide a general reading book department, falls to trade buyers like Randy Rosenzweig, who is responsible for titles spanning sixteen different categories ranging from fiction, cooking, romance and science fiction. “There are a number of criteria, such as the previous track record of an author, but sometimes all it takes is one review in the right place for that book to become the season’s ‘it’ book,” he maintains. 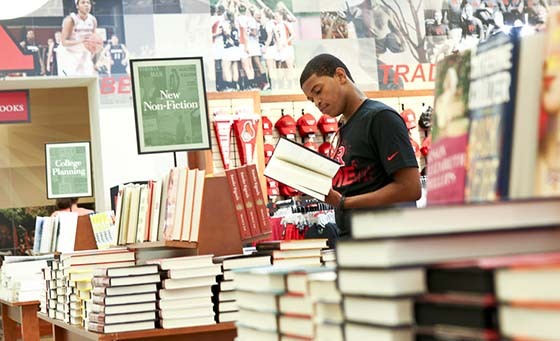 A student browses the general reading section of the Barnes & Noble at Rutgers University Bookstore in New Brunswick, N.J. The campus environment can also offer a different reception for even acknowledged national bestsellers. “There are crossovers with books that are popular with the general public, but typically you might see more literary fiction in our top performers, and they tend to be on that list for much longer,” Barney says. That last point might speak to a book having a particular resonance with the campus and the community’s word-of-mouth keeping the buzz about it alive. It also explains why a title like I Am Malala, chronicling the life of the remarkable 16-year-old girls’ education activist, or other political or literary titles, might fare better in the academic environment than the shopping mall. Another key component of the trade book selling process is the role of the store’s individual trade managers. 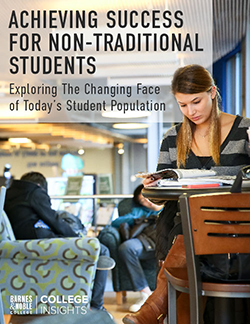 With a deep understanding of their unique market, managers must maintain strong connections to the campus to recognize the potential of new books, along with the ability to predict what titles will appeal. “We’ll buy what we think will sell, but it’s what happens when the title lands in the store that will really determine how that book performs,” Barney maintains. Managers can be very entrepreneurial, making decisions about how promotions are worked, floor space is allocated and how they can best present a book to the community. Events such as author signings are a key part of that process as well. “The real value is well beyond the people who turn up for the event,” Barney points out. “It’s to keep a liveliness in the store, to show our involvement in the community and that we recognize there’s a lot more than just putting books on the shelf and selling them,” he adds. As this holiday season approaches without the runaway blockbuster title that has characterized previous years in the trade book business, Rosenzweig looks to trends to determine what books he will order. Television celebrities continue to dominate his cookbook selections with Martha Stewart and John Besh, and Yotam Ottolenghi’s sequel to last year’s best-selling Jerusalem: A Cookbook, are all selling well. This year’s movie tie-ins have also affected sales of everything from World War Z to Markus Zusak’s The Book Thief. The recent opening of “The Hunger Games” Catching Fire, has revived interest in the franchise overall, but Rosenzweig is also keenly aware that his audience stretches beyond the student body. “Although our core market is students, in many of our stores, faculty, staff and the community make up the large share of our trade book market and we try to capture as many parts of that market as possible,” he says. Barney would agree. “We’re seeing a much larger spread across titles and consistent growth,” he says, citing titles such The New York Times bestseller by Donna Tartt, The Goldfinch, and Dan Brown’s Inferno. 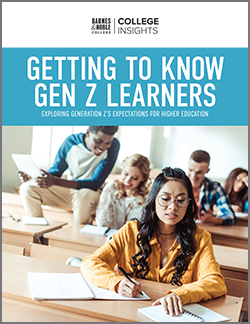 “We’re also seeing more activity in the lesser-known titles, and customers are spending more time and are being more deliberate when making their gift choices. This plays well to the breadth and variety of titles and related products we offer in our trade book departments. 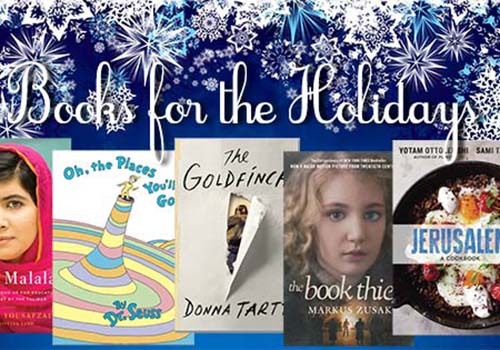 The ability to offer choices when there is not the one big book everyone has on their list is an encouraging sign for a strong holiday season,” he adds.